This page is here as an archive of the "Why A Duck" website. Click here for an updated version of the "Shows" page. In the future I am going to flesh out this section to go into more detail of the Marxes' Broadway career. For the time being all I have to offer is a glimpse into the past, when prohibition was in full swing, the movies hadn't yet found a voice, and the Marx Brothers were filling Broadway theaters to capacity and bringing down houses on a regular basis. Groucho was starting to get his writing published in various prestigious publications and Harpo had been adopted by the Algonquin wits. Choose one of the titles below to take a look at theater programs for each of the Marx Brothers' three Broadway hits, or read dialog from these shows that never made it onto film. Now featuring reviews of these shows by such luminaries as Percy Hammond and Alexander Woollcott (links to reviews at the bottom of each program cover page). 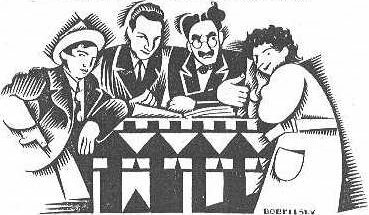 Although different versions of several (though not all) of these images were reprinted in "The Marx Brothers Scrap Book" in 1973, none of these actual images has been seen anywhere else since their original appearance in theater programs between 1924 and 1929. I hope you enjoy the words and images presented herein. This is just the beginning!